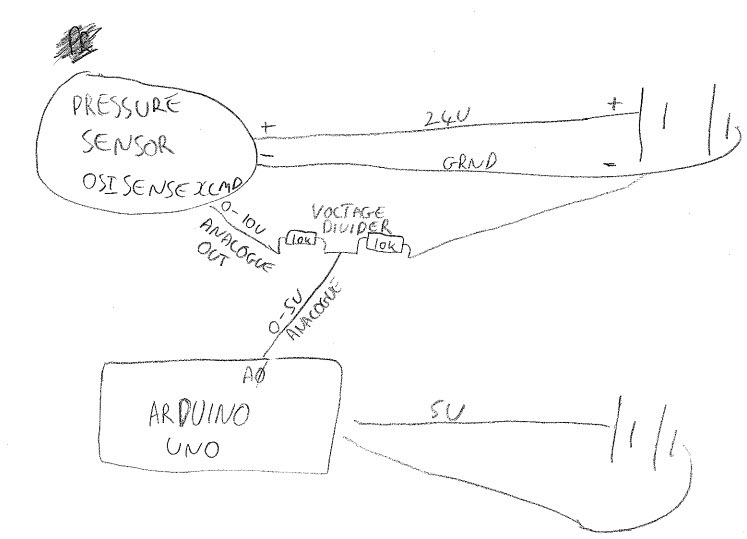 I'm using a Arduino Uno to read pressure and I want to know if I have wired/coded the sensor correctly. I'm not sure I'm getting the correct readings (it could be the right readings - I just want to check I have done everything right). The sensor I am using is an OsiSense™ XMLP pressure sensor that reads between 0 and 100 bars and gives out a 0v (zero bars) to 10v (100 bars) charge. Due to the Arduino Uno only being capable of reading up to 5 volts, I've used a voltage divider to reduce the maximum voltage the Arduino receives to 5v. I've attached a hand-written diagram. Let me know if you need any more information. I've attached the wiring and also the code. Reads an analog input on pin 0, converts it to voltage and then bar pressure, and prints the result to the Serial Monitor and also MQTT. Graphical representation is available using Serial Plotter (Tools > Serial Plotter menu). delay(2); // read twice with small delay to get accurate reading. Then, use sensorValAvg for your less noisy value. Edit: Also, make sure you connect all ground lines together, both from the sensor and the Arduino! I assume you have read @edgar-bonet about connecting the GND's. // This is for the DEFAULT 5V analog reference. // v = the voltage at the pin in Volts. // p = the pressure in bar. // normal atmospheric pressure at that moment. The analogRead uses default the 5V as reference. That means that if the project is powered by a USB cable, the 5V could vary between 4.5 and 5.0 V. That 10% difference will be seen in the resulting calculated pressure. In that case you can not measure more accurate than 10%. If the project is powered with a power supply to the power barrel jack, then the resulting accuracy depends on the accuracy of the voltage regulator on the Arduino board. The analog reference can be set with analogReference. The internal voltage reference of the Arduino Uno is 1.1V. That is reasonably stable, but it depends a little on the voltage of VCC and the temperature. The main problem is that it is different for each Arduino Uno, and it can be between 1.0 and 1.2 V. Therefor you have to measure it, and use the measured value in the calculation in the sketch. The input range is between 0V and the analog reference. Therefor you have to adjust the voltage divider to get 0..10V down to 0..1.1V. You could try: R1 = 100k and R2 = 10k. // with 100k and 10k. // Measure the AREF pin, and fill the value in for "1.10". All you have to do is to provide the common ground (0 potential) to your Arduino and your Sensor. The problem here is that they might be on a different potential. So just connect the ground of your 5 volts and 24 volts together and everything will work perfectly. Not the answer you're looking for? Browse other questions tagged sensors voltage pressure calculation or ask your own question. How to track a pressure sensor from analog inputs?